A woman whose diamond ring vanished while she was making fudge for a bake sale was despondent after scouring her home and finding no sign of it. But Linda Vancel recently got a sweet surprise: A relative of the woman who bought the fudge found the ring when he bit into a piece of the candy. A Bonifay man had first court appearance this week after being charged with four counts of burglary, including one in which authorities said he was found asleep on the victim’s bed. Responding to a 9-1-1 call at an Armstrong Street residence early Dec. 22, Bonifay police and Holmes County Sheriff’s Office deputies found Patrick Richard Hazell, of 801 Banfill Ave., asleep on a bed, according to a Bonifay police spokesman. The occupant of the residence told police he discovered Hazell asleep, holding the occupant’s loaded .22-caliber handgun. A number of the occupant’s personal items were on the bed with Hazell, the spokesman said. 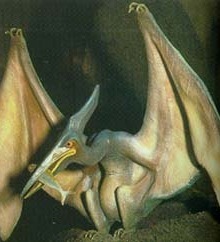 The pterodactyl made me do it! A 29-year-old Wenatchee [Washington] man told police a pterodactyl caused him to drive his car into a light pole about 11:30 p.m. Thursday. Wenatchee police cited the man with first-degree negligent driving. A breathalyzer test showed “a minimal amount of alcohol,” said Wenatchee police Sgt. Cherie Smith.